Last year I had the pleasure of spending a day in Gondwanaland among the rare Wollemi Pines, and the heady scent of the oil aroma of over 200 Eucalyptus trees whilst installing a Herd of Deer for a sculpture exhibition set in the grounds of the extensive gardens of Marks Hall. Areas of the gardens were devastated during the 1987 hurricane and it was decided to clear one of the areas of its conifer crop and to create Gondwanaland. Named after the ancient super continent that formed the evolutionary cradle for the vegetation of South America, the Indian Subcontinents Africa and Australasia, the area has been planted with a mixture of southern hemisphere planting including the rare Wollemi Pine, over 200 Eucalyptus trees and an experimental planting of Cordyline australis, the Cabbage Palm, Agapanthus and Cortaderia richardii New Zealand Pampas. On a warm sunny day the oil aroma of the Eucalyptus trees provides a heady scent. Wollemia nobilis (Wollemi pine) a tall tree with a slender crown has been dubbed a ‘living fossil’ as it represents the only remaining member of an ancient genus dating back over 65 million years, to the time of the dinosaurs. Known only from fossils until 1994 when it was found growing in a rainforest gorge in Australia, this fascinating tree caused great excitement in the botanical and horticultural worlds. With less than 100 trees known to exist in the wild it is now the focus of extensive research to safeguard its survival. The Australian authorities have propagated trees for sale in order to fund the care of the trees remaining in the wild. The trees have very little genetic variability so the small population left in the wild is easily threatened. 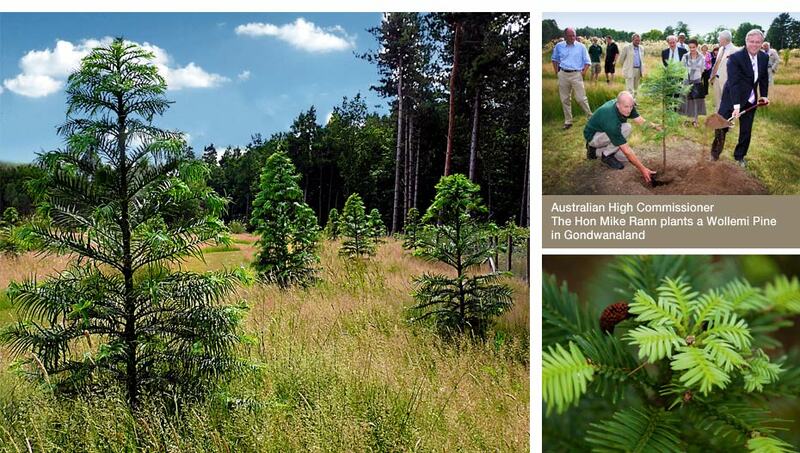 In order to widen the distribution of the Wollemi pines, saplings have been sent all over the world.